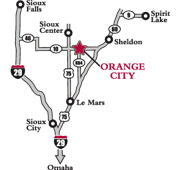 Northwestern College is located in Orange City, a community of 6,000 people in the northwest corner of Iowa. Our GPS coordinates are 43.000053° (LAT), -96.058238° (LON). You must stay overnight on campus in order to be eligible for the airfare reimbursement. If your trip includes a visit to another college, Northwestern will reimburse you up to $150 (excluding baggage fees). Only high school juniors, seniors and transfer students are eligible for the one-time flight reimbursement. Additional visits will be at the student's own expense. Tickets for traveling companions are not eligible for the reimbursement.